Nami Zarringhalam, Co-founder and Chief Strategy Officer, Truecaller said " Since launching Truecaller Pay in 2017, we've seen an increasing number of use cases to make the lives of our users in India easier. By acquiring Chillr, we are reaffirming our commitment to mobile payments and strengthening our plans to increase its adoption amongst our user base." The founders of Chillr - Sony Joy, Anoop Sankar, Mohamed Galib and Lishoy Bhaskaran - will join Truecaller, along with the rest of the team. Joy will be appointed Vice President of Truecaller Pay. 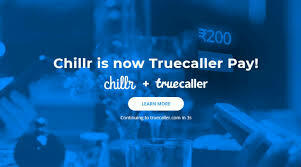 Zarringhalam told " We will, together, have a far bigger impact in this space through the foundation of the team's expertise and a strong user base that trusts our platform and use it on a daily basis"
Truecaller Pay is a UPI-based mobile payments service that was launched in partnership with ICICI Bank. All the banking and transactional data of the customers is handled by ICICI Bank as per RBI guidelines, and Truecaller will not handle data such as account details, or credit or debit card information of its users. It has been designed as a feature within the Truecaller app itself - you won't need to download or install any standalone app confirms the media sources.